On January 2, 2014, the crafting industry received sad news. Archiver’s the local scrapbook store were closing all their remaining stores by mid February of 2014. Archivers has served as a home to find new innovative products, exclusive product lines, workshops throughout the year for card makers and scrapbookers, crops, and more. The staff was knowledgeable of various products lines, helpful when needing ideas on layouts or projects, and a great staff that will be truly missed. This establishment has carried our world to another level that many of the bigger box stores has failed to gap the bridges to. This also, with great sadness meant an end to Scrapfest that has been held at the Mall of America for the past few years. Through Archiver’s crops and Scrapfest, friendships has been bonded with strangers who now are dear crafting friends. As they are beginning to liquidate their stores it’s with sadness that many friends are joining and coming together one last time before the doors closed for good to crop together. With mixed emotions this is also an exciting time for this industry as new product lines are being launched this week. The Craft and Hobby Association is launching the Winter CHA Trade Show beginning Saturday, January 11th through Tuesday, January 14th. Many of my favorite designers and product lines have been giving sneak peeks of their products on the social media streams. I’ll be sharing you some of my favorite picks for the season on my Facebook page. As the year 2013 comes to an end, this year has been a blessing but I am excited to embrace the new one as well. My final journal entry for 2013 is going to reflect in my December journal some of the most important things that has happened to our family or myself or moments of times that has been influential during this time period. I hope you take a moment to reflect on 2013 and be ready to embrace a brand new year filled with creative and inspiring moments. Have a Safe, Happy, and Creative New Year! Happy Christmas Eve! I hope you are feeling creative and inspire today. I have to wrap a few gifts, bake cookies, bake a cake, and start dinner before Christmas Eve Service. 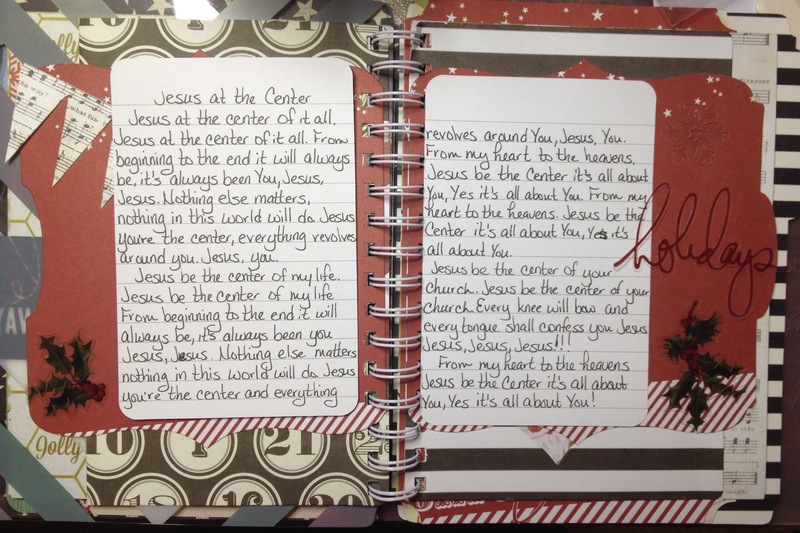 As I was preparing the cookie dough in the early a.m. Moriah took out her journal and wrote what the true meaning of Christmas meant to her this year. As she read back to me what she had written, I was overjoyed to know that she really did understand what Christmas was all about and she had be paying attention to all our conversations. I hope you share more of Christ (Christmas)! The music played during the Christmas season brings hope, love, and joy. This Christmas Season I encourage you to find what song speaks to your heart this year. Maybe this year that song is ‘Silent Night’, ‘O Holy Night’, ‘Jesus is the Reason for the Season’, or maybe it’s ‘The First Noel’ or ‘Now Behold the Lamb’. Whatever the song that has touch your heart this season, I encourage your to document it. Yes, you remember it now and maybe a year from now you may remember it still. How about 5 or 10 years from now will you still remember how you felt when you read and song those lyrics? Or how the emotions of joyful tears ran down your face as you song this song throughout the season? Embracing the moment the words flowed out of your mouth and the anointing wrapped around your heart of the true meaning of Christmas 2013 and what it really meant to you. I hope you search deep and find the Christmas melody in your heart this year and share it with others. In my journal this song below that I have written the lyrics of is not a Christmas song. This is a song to me that defines what Christmas 2013 means to me. I love all the traditional and contemporary Christmas songs but this one is the one that is singing in my heart when the music stops and fills my heart with joy and love that the most wonderful Gift anyone can have has been given. Sing a new song and rejoice! One of my favorite things to do during this season is to bake. I also includes this is my creative and crafting time. I enjoy baking with the assistance of my daughter,Moriah, and my Kitchen Aid (stand and hand) mixers. As I prepare for this holiday season I begin by researching new recipes and still using some old faithful ones as well. With the help of social media the sharing of recipes are easier than ever. One of my goals is to scrapbook with pictures all the various recipes that I use during each Christmas Holiday. My hubby calls me the Cookie Monster and of course our daughter has fallen into my footsteps as well. The cakes, pies, and brownies are good but nothing makes it better than a COOKIE. The baking of various cookies such as chocolate chip, butter, peanut butter, oatmeal cranberry, cut out cookies, spritz, and the list goes on and on just to name a few. There are so many tools to be creative when baking such as: cookie molds, the cut out shapes, rolling pin, cookie press, and piping bag just to start to creativity of baking. 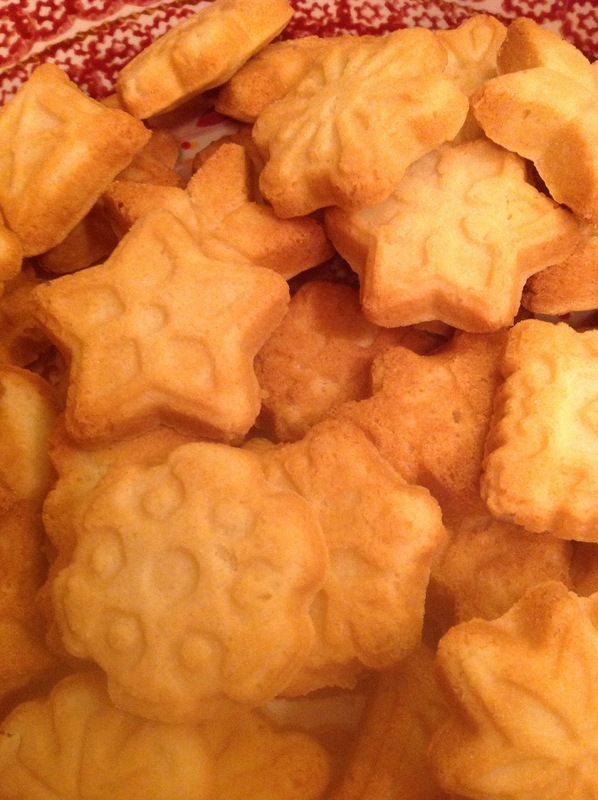 I love the aroma that cookies leave in your home as they are baking in the oven. They are easy to transport, make great gifts,and good for sharing at school, work, or just at home in the cookie jar. Also, great for the Christmas party that we’re attending today with over four dozen baked and ready to share. Share a Cookie this Christmas! The stockings are hung with care, the gifts are stashed all over the house, and the list is checked, well checking it twice to make sure all gifts have arrived and accounted for. Now it’s time to make sure all gifts are prepared for wrapping. Do you design you own paper? Do you make your own bows? How about making your own tags? Well a great technique if you have old wrapping paper turn it inside out and use Christmas stamps to decorate it. Also, using distress ink and copics markers will make this paper stand out under your tree. The bow maker tool can make you look like a pro or you can get creative and just let your creativity inspire you. Then the finishing touches of tags can be cut out on your cutting machines such as the circuit, cameo silhouette, cuttle bug, or big shot. I also like to freestyle design of cutting it out on your own. Using color paper, inks, markers, gelato, and glitter with you stamps or embossed designs. Let not only what’s inside the box bring a smile on the recipient face but the presentation before it’s even opened, Now that’s a wrap! Shhhh…. Can you keep a secret? Let me give you a sneak peek to another craft gift idea that I have purchased for my daughter at the Scrapbook Expo this summer. 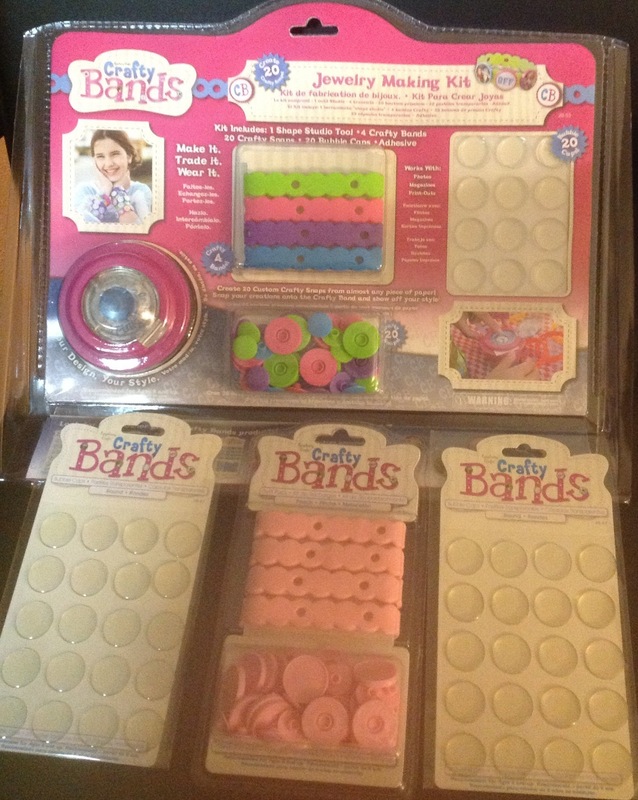 This product is called Crafty Bands and this has been created by our friends at Epiphany Crafts. Now, if you already have both the small and large circle Epiphany Craft tools this size is a difference circumference. This would be consider a medium circle size tool. How awesome is that? Now your child can share a tool with you. Your child can use this tool to make interchangeable bracelets to correspond with various styles. This tool is not just to make jewelry but it also can be used to create scrapbook layouts or cards. I’ll post a review on this and share this after the Christmas holiday. I hope you incorporated a crafty gift for someone this Christmas season. 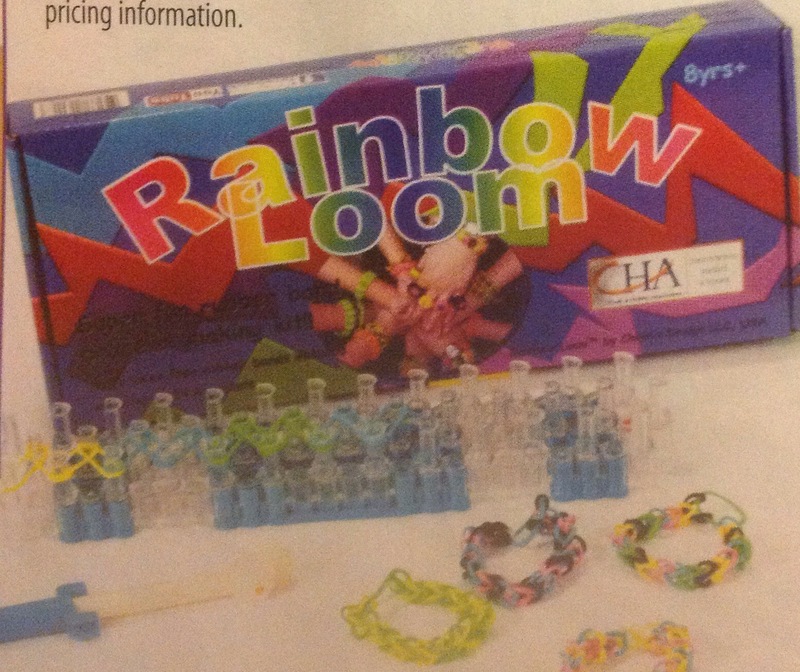 One of the hottest newest crafty gifts that has hit the youngest crafters by storm is Rainbow Loom. This was a big hit at the CHA and the hottest product not only for girls but boys has taken to this as well. Moriah has had one since this summer and has enjoyed making bracelets, necklaces, rings, and pendants. This hot item can be found at some craft stores or specialty stores. Although the box says for ages 8+, my six year has grasp the concepts and has advanced to the more complicated ones as well. Thanks to YouTube and older friends they have connected and her Christmas list consisted of a second one so she can do even more advance crafts. The rubber bands comes in a variety of colors, tye-dyes, glitter, glow in the dark, neon colors, and jelly. I think this is a great crafty gift.